Idiopathic scoliosis, by definition, comes from an unknown source. Most scoliotic formations are classified as idiopathic and exist for no definitive reason. Idiopathic versions of scoliosis are usually associated with adolescent varieties and these profiles account for the vast majority of scoliosis cases worldwide. However, idiopathic labeling can also be applied to other types of scoliosis, as well, including congenital, infantile, early childhood and adult classifications. Doctors have studied idiopathic scoliosis for generations and have created many theories about its origin. Some of these theories have shown themselves to be correct, at least in terms of contributing factors, while others have been dismissed as unscientific and often illogical. To date, the medical establishment still does not know where scoliosis comes from, what incites it and how it may be prevented. This important dialog investigates the most commonly seen types of scoliosis: the idiopathic variety. We will examine some of the various pieces of research evidence that have been helpful in narrowing down contributory causes of side-to-side atypical backbone curvatures, as well as look at some ongoing state of the art research that might eventually provide definitive answers on why scoliosis forms to begin with. Idiopathic classification of scoliosis is certainly the most common variety of unusual side-to-side spinal curvature that is observed in the medical establishment. Most patients simply do not demonstrate any particular identifiable factors that might lead them to develop atypical vertebral curvature. While most idiopathic type scoliosis is found in adolescents, in association with rapid growth spurts leading to maturity, idiopathic varieties of abnormal side-to-side curvature can be classified as many other types of scoliosis, as well. Some congenital scoliosis is considered idiopathic, while other cases can be traced to suspected or definitively proven circumstances. Some infantile scoliosis can be traced to congenital defects or life circumstances, but most cases remain labeled as idiopathic. Early childhood scoliosis follows a similar pattern, with the majority of patients developing scoliosis for unknown reasons. Adult, developed scoliosis is usually linked to a specific known or suspected causation, but some cases are still classified as idiopathic. All in all, worldwide, most patients with atypical spinal curvatures have conditions that are considered idiopathic, despite many decades of active research trying to ascertain the underlying reason why scoliosis forms. Many doctors realize that there is evidence of a genetic link in scoliosis cases. Families often seem predisposed to develop atypical side-to-side curvatures that run in the bloodline. However, the genetic information that might pass along this tendency has not been positively identified. In other cases, there is a primary congenital condition that is responsible for creating the secondary scoliosis, such as spinal bifida. Some of these conditions have been identified as running through the genome code and specific genes have been isolated for some of these problematic conditions. Many doctors also believe that most youth-developed scoliosis of idiopathic origin can be linked to congenital spinal issues that were never discovered or diagnosed due to the subtlety. Some doctors believe that most scoliosis is congenitally-motivated and caused by pre-birth spinal development concerns, regardless of the age of actual onset and diagnosis. Once again, the congenital factors responsible for this might be linked to genetics or might be a result of maternal lifestyle factors, especially during pregnancy. Research into the origins of scoliosis has been ongoing for generations already. Throughout history, the condition was thought to be pathological for a very long time and has been linked to numerous suspected causes ranging from religious sins to psychological problems to various health issues that were “in vogue” at the time. Fortunately, we live in a slightly more enlightened time of medical science now and doctors seem content to focus on the two very plausible theories detailed above. 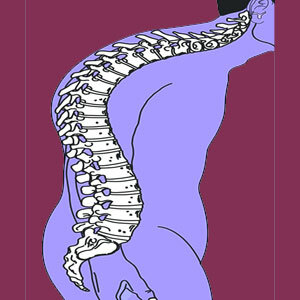 Regardless of the underlying cause of scoliosis, the effects on the patient are the same. Therefore, focus remains on monitoring and treating the physical effects of the condition, although more time and effort should be spent monitoring and treating the negative psychoemotional consequences of atypical side-to-side backbone curvatures. The primary reason that research about the cause of scoliosis continues full force is the objective of being able to prevent the condition by recognizing and undermining its source mechanism. If this goal is ever attained, then idiopathic scoliosis could become a thing of the past in most cases. With the extreme scientific focus on genetic code at the current time, we feel that this objective will become reality within a timeline of a few decades.